You can create your own design or fashion your pillow along the lines of this one that I made for this class. I started with a piece of white PFD Kona cotton and painted the background with an acrylic wash of color. Next I painted the flowers and layered the piece with batting and lining. 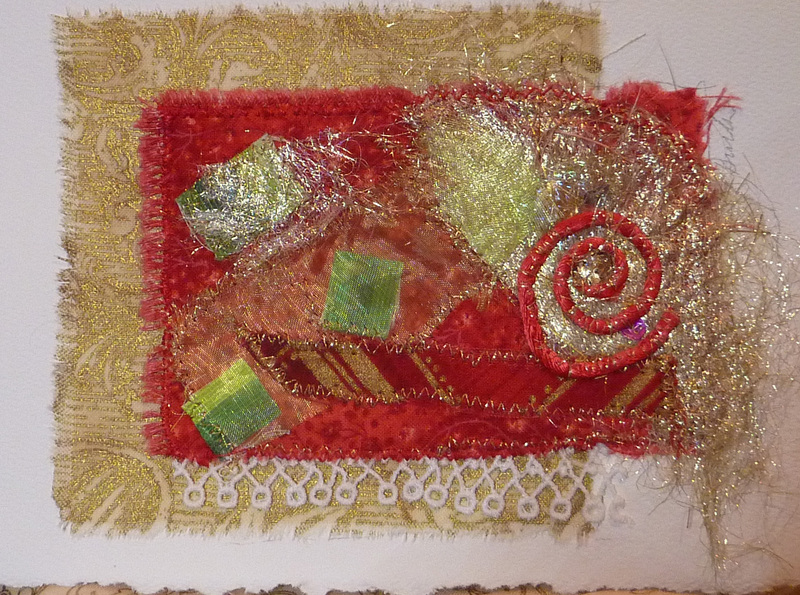 Then the REAL fun began as I used thread painting to add depth and texture to the design. 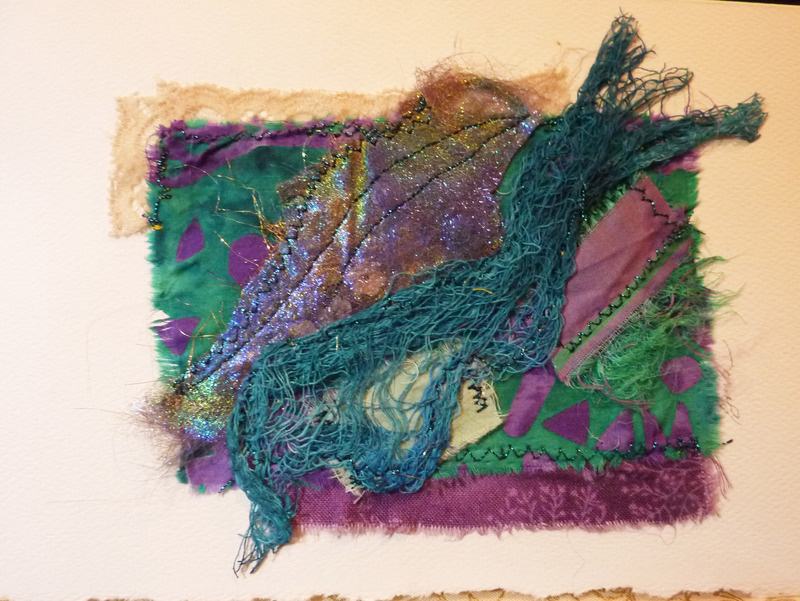 Here’s where you can really let yourself experiment with color and various thread weights. I particularly liked the look of some variegated 30 wt. thread. When I declared the thread painting “done” I got out my beads and went to town! Because this will be used for “show and tell” in class I wanted to be sure to incorporate several basic beading stitches. 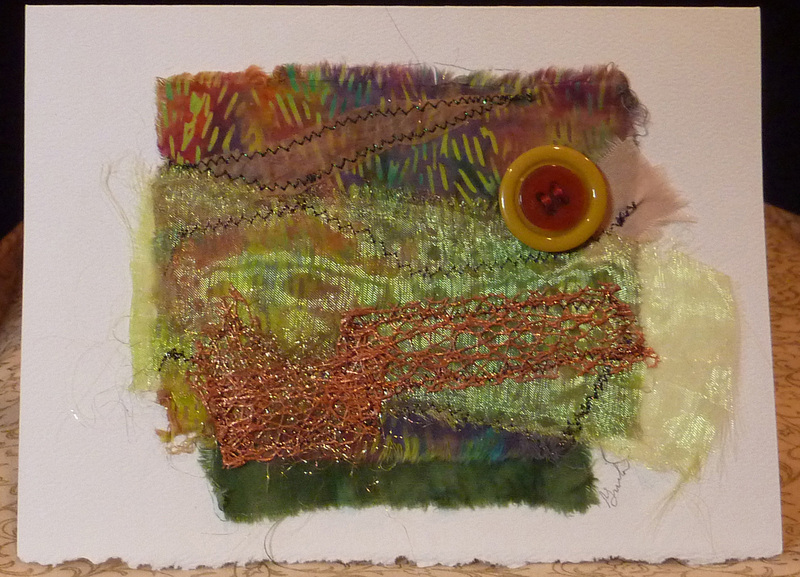 I used moss stitch, scatter stitch, seed stitch, bugle pathways, back stitch and stacked stitch. 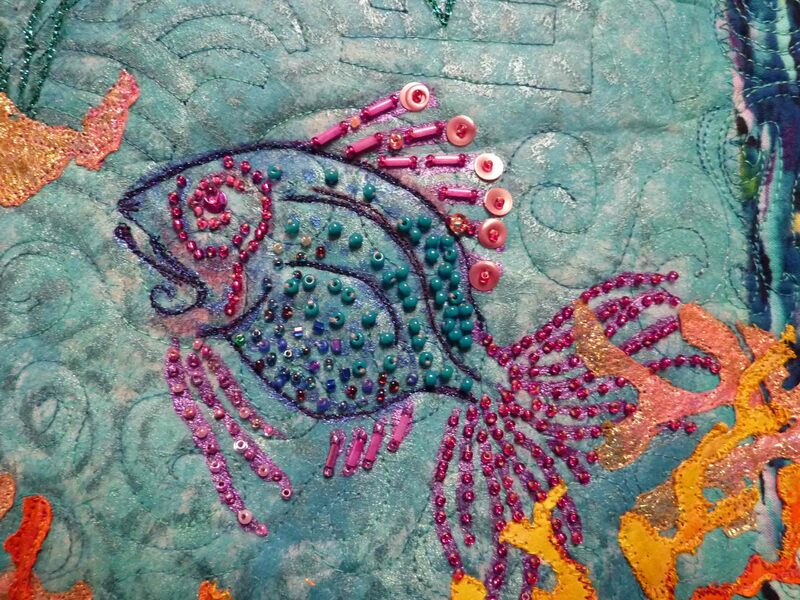 My goal was to achieve a vibrant mix of color, texture and bling. Call Baron’s today to sign up – This is a FUN class. Okay, who said that first? Well, it must’ve been during the last half of December when those words were uttered. What’s the deal, folks? It doesn’t seem to matter when I start the preparations, this time comes and there’s so much left: shopping, cooking, sewing, painting…..Ahhhhh, but I love it all !!! 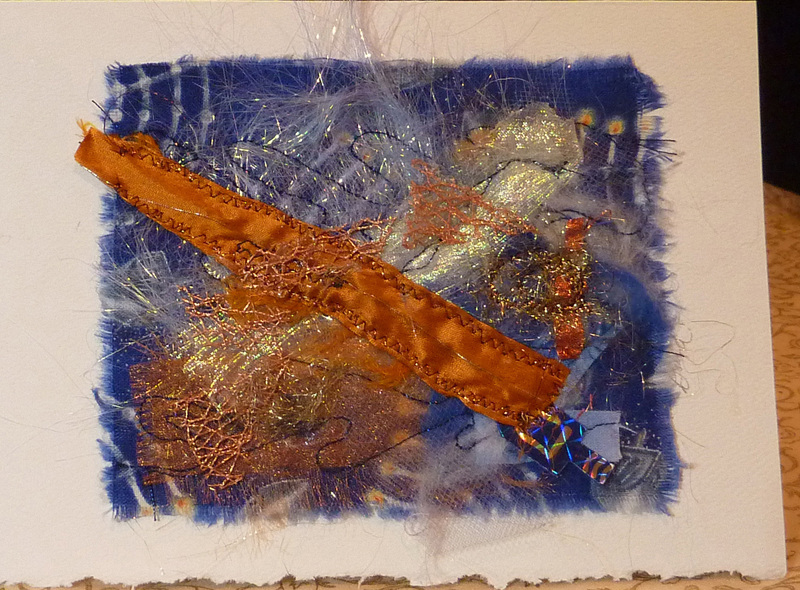 They are mini Fiber Collages mounted on an acid free 5 by 7 inch Strathmore deckled edge card. The card itself is blank inside so you can write the message of your choice OR just put the card in a frame. Either way, if it’s a gift it will be sure to be enjoyed for a long time. I’ve been busy preparing for what is shaping up to be an exciting Fall schedule of teaching. 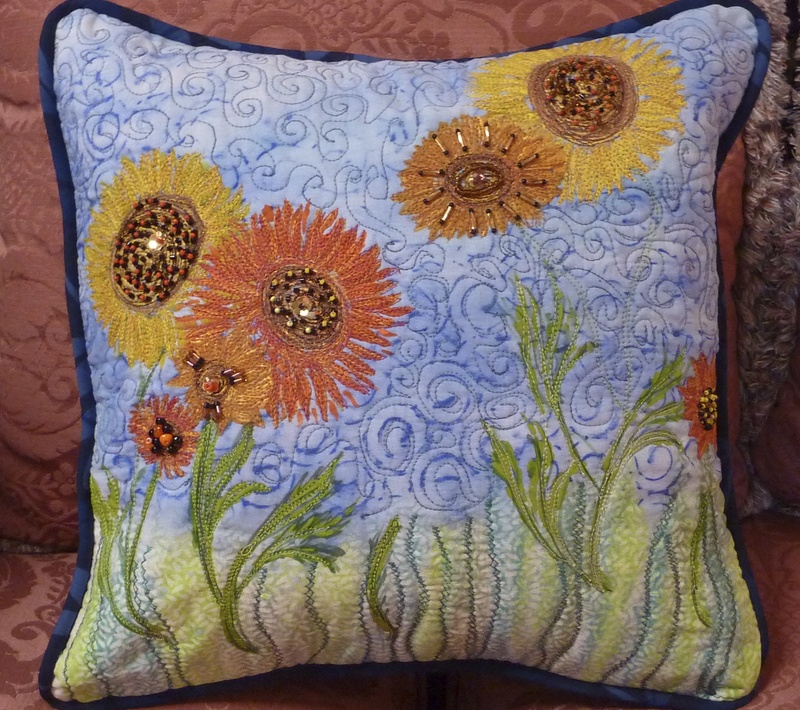 One of the new workshops planned is to make your own decorative pillow. 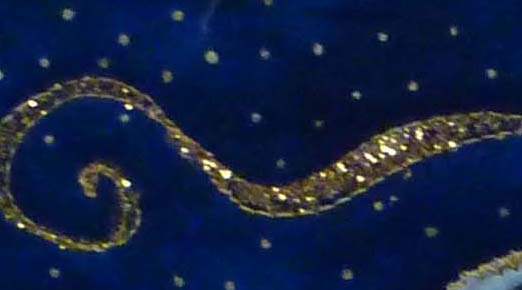 You will paint your own fabric and embellish it with beads. The class is on the schedule at Baron’s Sewing Center in Woodland Hills for September 24th and October 8th, 2013. Here is the one that I finished the other day. 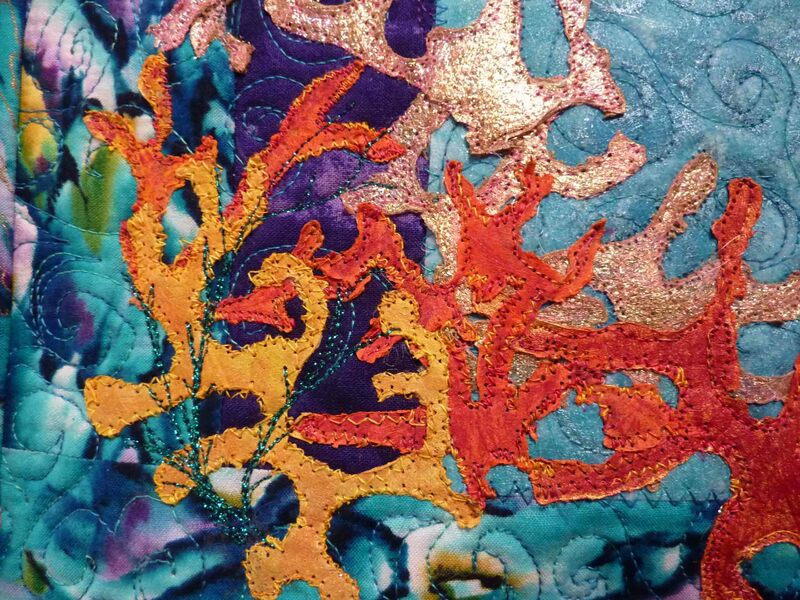 My goal was to achieve a vibrant mix of color, texture and bling. Did I achieve it?? Heya blogees, I’m about to open the package and get out my new soldering iron. These here are just a bit of delaying tactics in case you didn’t realize. I’ve never used one of these contraptions but have been busily scouring the google and the youtube 🙂 to do my research. All that I want to do is to solder a few jump rings. 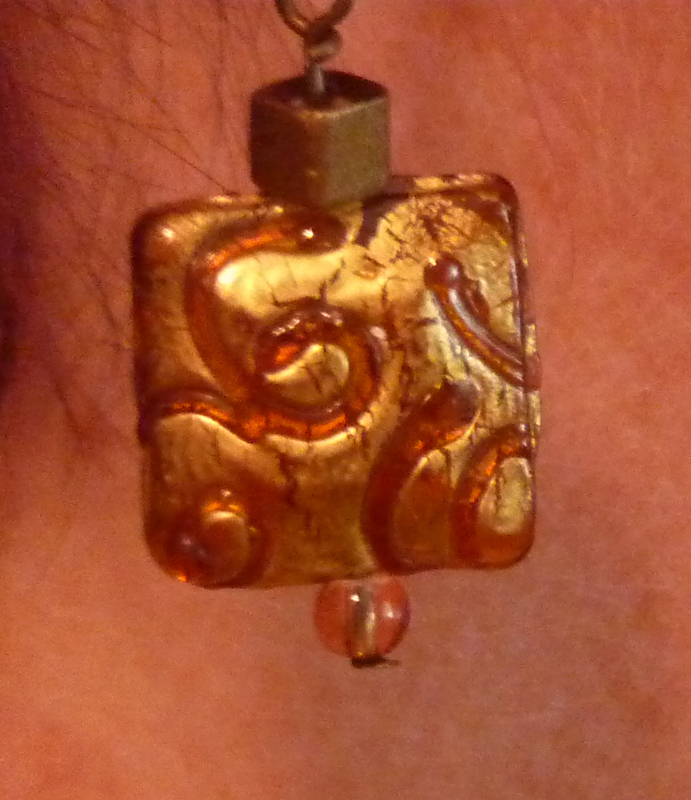 I usually don’t have a problem getting them to stay put (and the earring or whatever to stay together) but every once in awhile there’s a wayward badass among ’em. Have a wonderful week y’all! This was such a fun quilt to make. It contains so many different techniques and required so many design decisions that I thought it would be a good one to blog on. I started this quilt in a workshop about using Lutradur. We did several kinds of painting on Lutradur and incorporated some stamping. 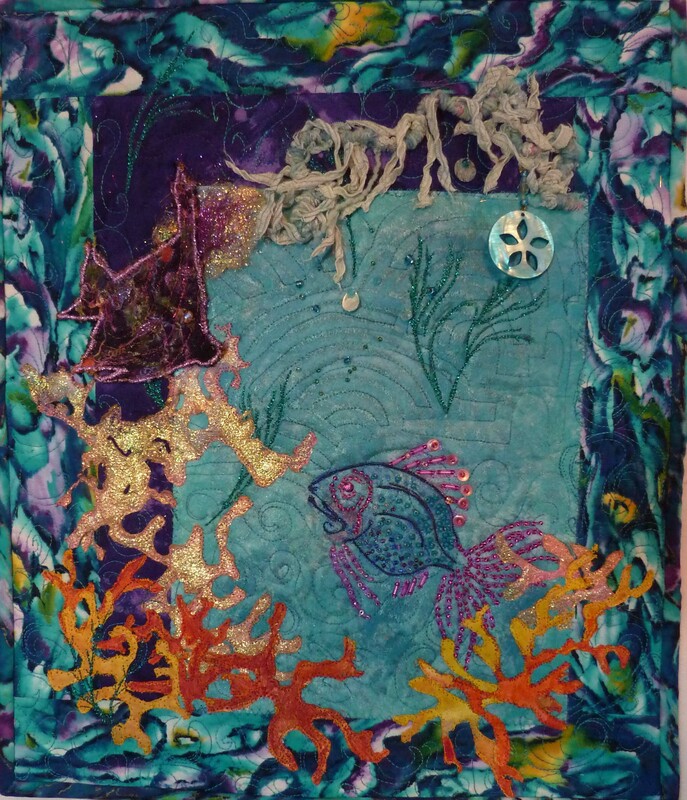 I had a piece that I painted in shades of blue Lumiere – thinking ahead to using the finished product in an art quilt with an underwater theme. 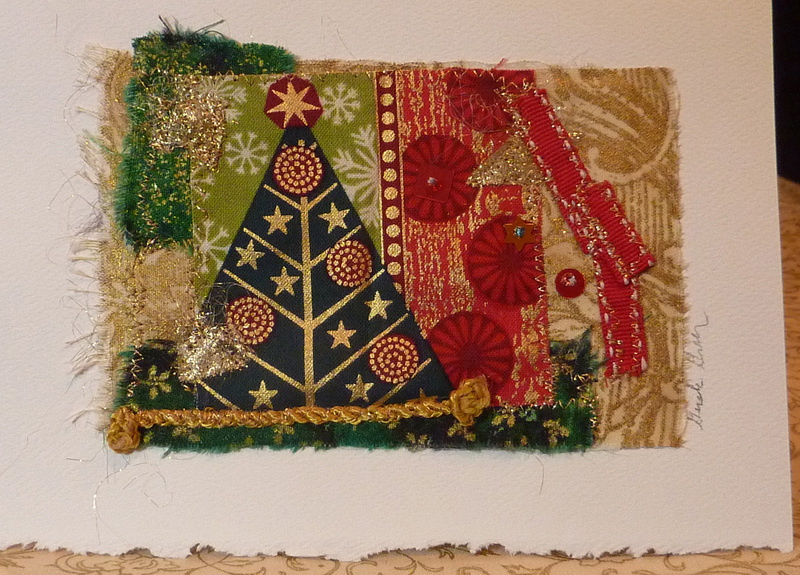 I was in MY element being able to conjure up a variety of embellishments to use on this piece. My favorite is the kelp. I used a pipe cleaner (aka fuzzy wuzzy wire) as the base and wound some yarn from my knitting leftover bag around it. 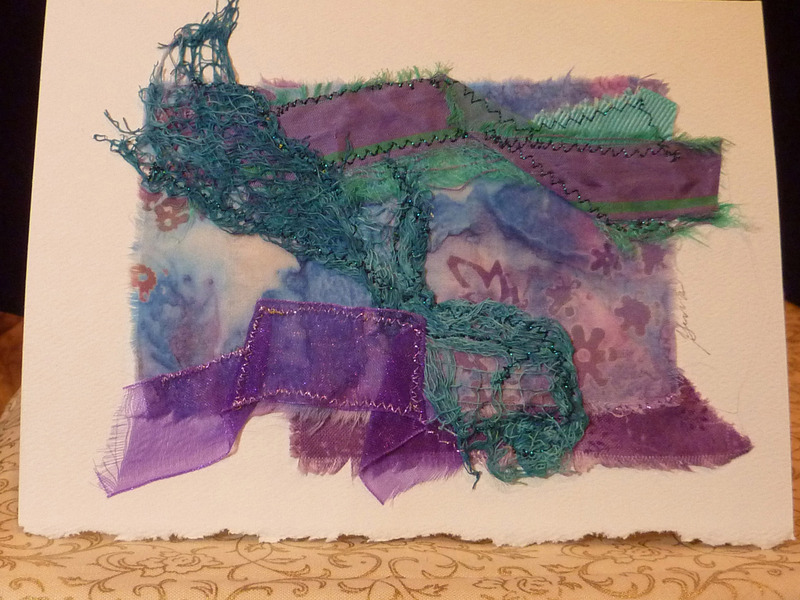 Then I was able to bend the piece the way I wanted it and couched it to the background. 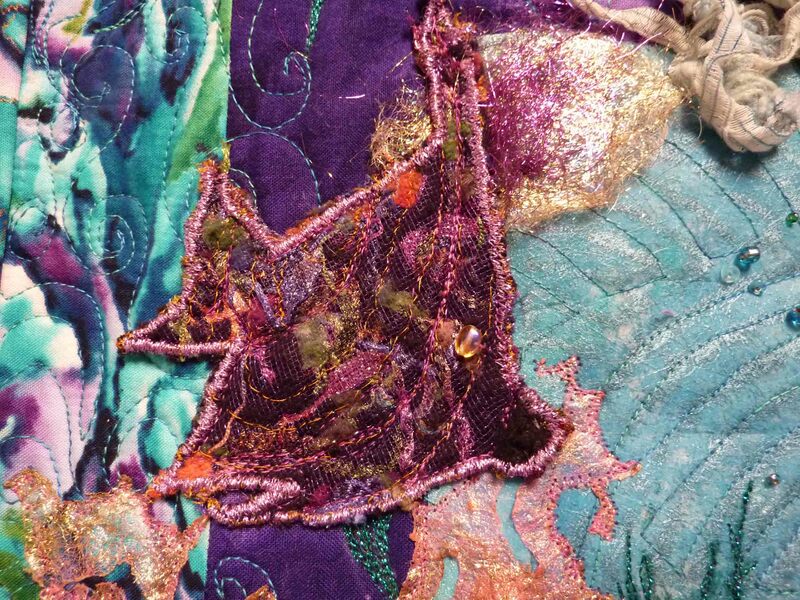 The dark purple fish was made ‘offline’ with some underfabric, netting and a lot of thread painting, then attached to give a slightly 3D look. The coral was a lot of fun to make. First I painted some lutradur and created the coral shapes with a heat tool. 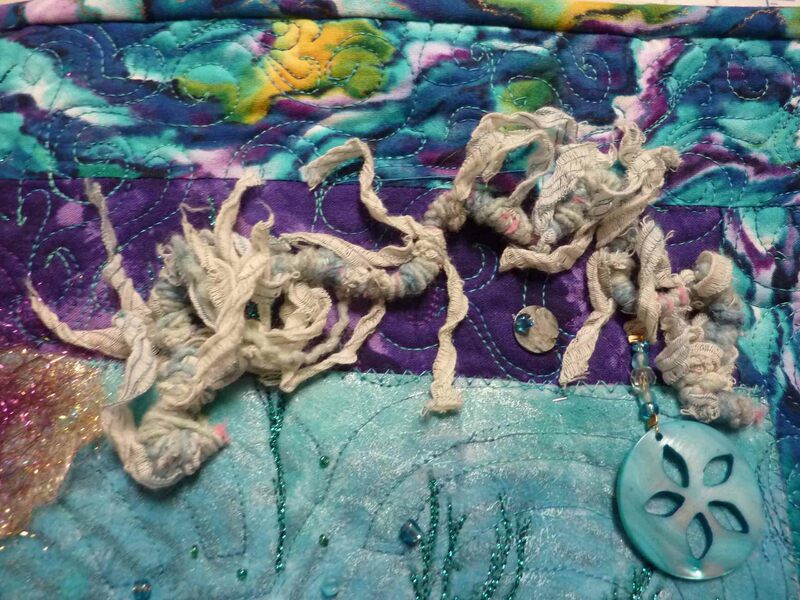 I just burned away to get the shapes that I wanted then stitched them down. 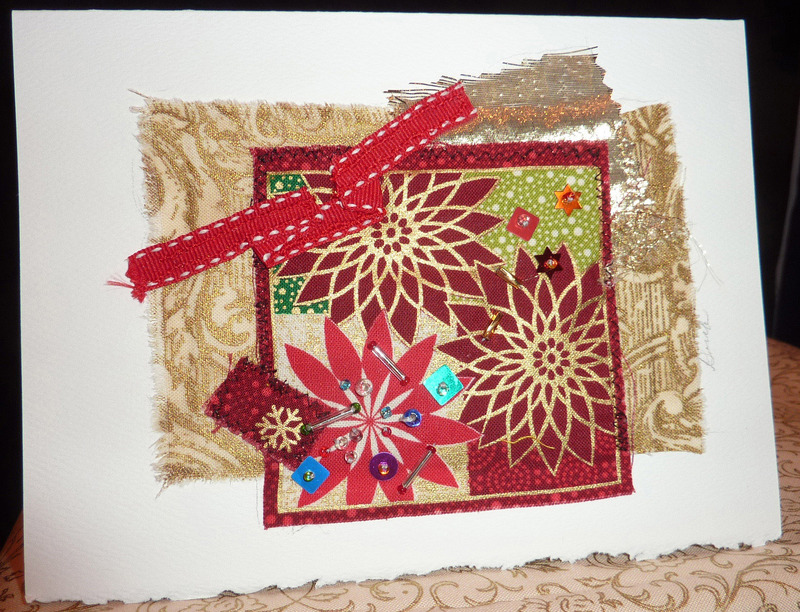 A variety of threads were used in the quilting including my favorite bling thread – #30 Madeira . All the beading was done by hand. I finished the quilt with a traditional hand stitched binding. Do you love coffee? I do – especially that first sip in the morning. So what did I do? 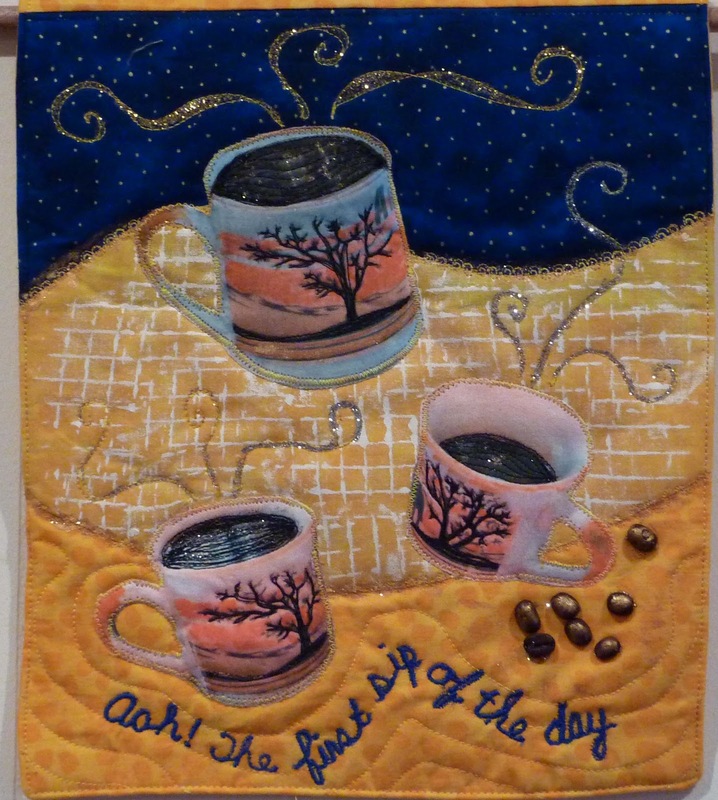 I made a little art quilt in honour of that AHHHHsome moment: the first sip. I pieced the background to loosely approximate my kitchen – yellow tile counters – got the grid effect with a paintstick rubbed over a plastic utensil that I found in the kitchen drawer. 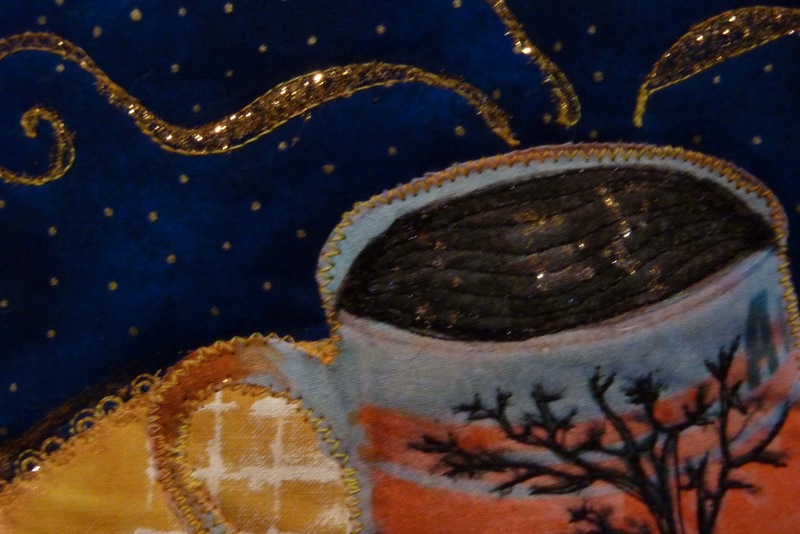 I paid homage to my very favorite coffee mug by using its image in this piece – printed then machine appliqued onto the background. Thread painting, acrylic paint touch up here and there added texture and interest. 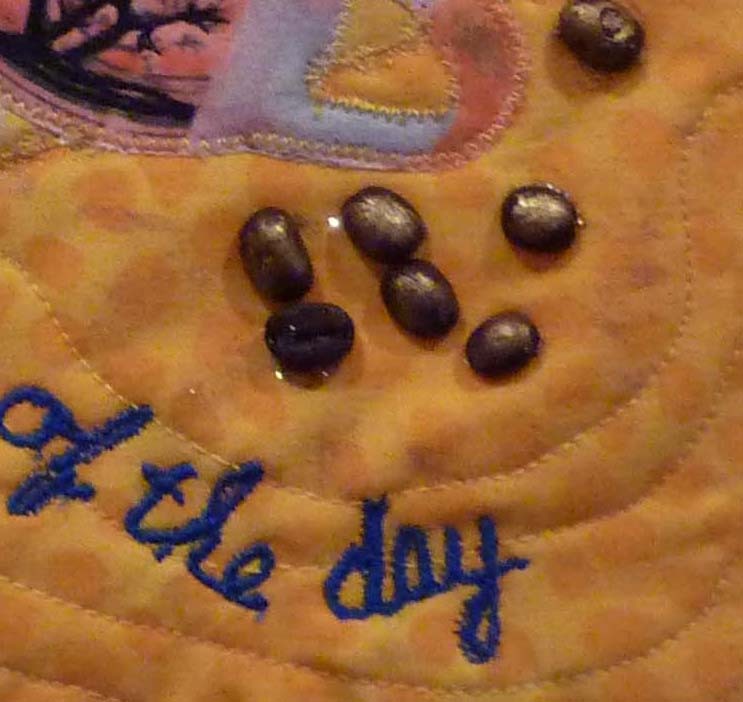 Glitzed up a few coffee beans for the full effect and free motion stitched my sentiments.